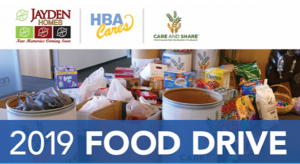 April 15, 2019 – Jayden Homes invites you to join us, The Housing and Building Association, and HBA Cares in collecting 100,000 pounds of food for Care & Share of Colorado Springs. 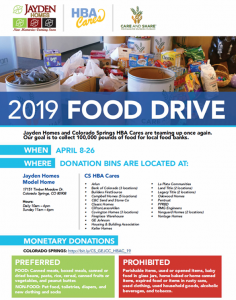 Now through April 26, Jayden Homes, a Colorado Springs custom home builder, will be collecting canned meats, boxed meals, canned or dried beans, pasta, rice, cereal , canned fruits and vegetables, and peanut butter. Additionally, Care & Share is in need of pet food, toiletries, diapers, new clothing, and socks. The Jayden Homes model in Walden is located at 17151 Timber Meadow Dr., off Hwy. 83 and Hodgen Rd. The model is open daily till 6 p.m.
About Care & Share: Care & Share provides food to partner agencies across Southern Colorado to serve our neighbors in need because well-fed communities are better for us all. Learn more about Care & Share at careandshare.org.  About HBA Cares: HBA Cares partners with other nonprofits, engaging industry resources to support transitional and accessible housing and other community projects. 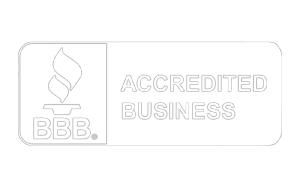 Learn more about HBA Cares at hbacares.org.